BBC finds shrapnel at Thai blast site Jump to media player Police are continuing to hunt for those responsible for Monday's deadly bomb blast at a shrine in Bangkok, but it has emerged that in the rush to clean up some evidence has been missed. Bangkok bomb: Voices from the shrine Jump to media player The Bangkok shrine which was hit by a deadly explosion on Monday has reopened to the public, but those who live and work in the area will never forget that dark day. Bangkok bomb police hunt 'network' Jump to media player The bomb attack that killed 20 people at Bangkok's Erawan shrine on Monday was carried out by a "network", Thailand's chief of police has said. CCTV of three suspects Jump to media player Two men identified as suspects in the Bangkok bombing have handed themselves in to police, insisting they are tour guides, authorities say. Footage of explosion at Bangkok pier Jump to media player There has been an explosion at a pier in Bangkok, a day after a deadly bomb blast at a shrine in the Thai capital. Bangkok bombing: Shrine reopens Jump to media player The BBC's Steve Evans reports from the Erawan Shrine which has reopened to the public, following Monday's bomb blast. Who could be behind Bangkok attack? Jump to media player With the Thai government saying it does not know who is to blame for a bomb blast in Bangkok,, Bridget Kendall looks at who could be behind the deadly attack. Police are continuing to hunt for those responsible for Monday's deadly bomb blast at a shrine in Bangkok, but it has emerged that in the rush to clean up some evidence has been missed. 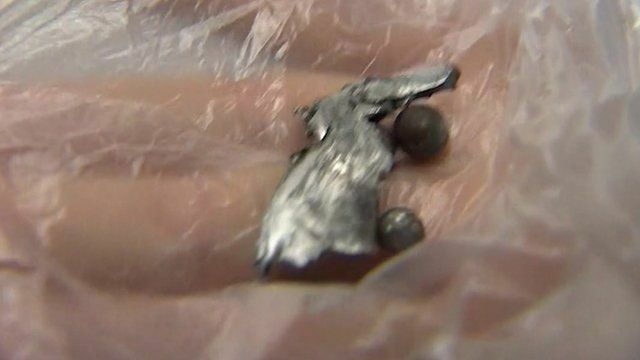 The BBC's Jonathan Head was handed ball bearings and shrapnel at the site of the blast that had not been collected by forensic teams. After this footage was shot the BBC team managed to hand the shrapnel over to the police.